This new mini-series focuses on activities for children aged under 24 months. From developing tastes for food and recognising familiar voices, to discovering that they find comfort from sucking their thumb, it’s hard work being a baby! Even before they are born, a baby’s developing brain is making sense of the outside world. Connections are being made with the wealth of sensory experiences that they are trying to fathom out. 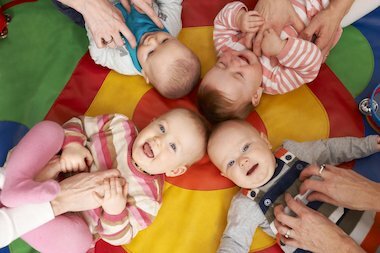 Incredibly, everything that these young babies are learning is helping them to develop key skills that they will use in life outside of the womb. By the time a baby arrives in the world, they are raring to go and more than ready to learn. Babies are not born as blank canvases, babies are born as learners.